5 minute walk from our peaceful neighborhood to downtown. We are very fortunate to be located within a great quiet residential location. Yet only 300 feet from Main Street, one block to the River Place shops and less than a 5-minute walk to both the Bavarian Inn or Zehnder’s Restaurant in downtown Frankenmuth. Also, you can walk across the street and enjoy a round of golf at the Fortress Golf Course. The house has a comfortable homey environment with lots of character. It’s a very clean, spacious, beautiful, historic home with original wood floors and trim throughout. After a day of shopping, eating, golfing or relaxing in one of the local biergarten’s, enjoy coming back to a quiet residential setting. Kick back and grill out on the private back patio overlooking the spacious back yard or sit on the large cozy front porch and watch the horse drawn carriages go by. We have 4 spacious bedrooms (master on the main floor), 2 full baths (one on each floor), dressing room (great for wedding parties), large fully equipped kitchen, dining room with large gathering table, upstairs and downstairs living rooms, rec room with games and ping-pong table. You’ll fall in love with the peaceful setting and many great amenities! A perfect location for your Frankenmuth getaway or retreat. We invite you to experience the intimate atmosphere and discover one of Frankenmuth’s best-kept secrets. We have been marred 16 years and feel very lucky to be living in Frankenmuth. My husband is a supervisor for Delta Air Lines and I have been involved in property management, with family partners, for 20 years. This is our first vacation rental and happy to say, we are the sole owners. I’ve never enjoyed managing a property as much as this home, we take great pride in getting the house ready for our guests and hoping to exceed their expectations. Living locally makes it easy to confirm everything is perfect before guests check in. We chose this area because Frankenmuth is one of Michigan’s premiere vacation destinations. Known as “Michigan’s Little Bavaria,” due to its German heritage. It’s a place of horse drawn carriages, covered bridges, river boat cruises, world-famous chicken dinners, big water parks, and small-town strolls. Beautiful floral landscape throughout downtown, unique shops, restaurants, and beer gardens. All makes this a great place to getaway to during every season. We immediately feel in love with this property from the moment we looked at it. The location is perfect! Great neighborhood, short walk to downtown, and across the street from the golf course. The grounds are beautiful. It has a large back yard with patio for BBQ’s and entertaining. The driveway is long and will accommodate 5 cars. It also has a large front porch for relaxing. I knew this was going to be the perfect vacation home as soon as I walked in the door. 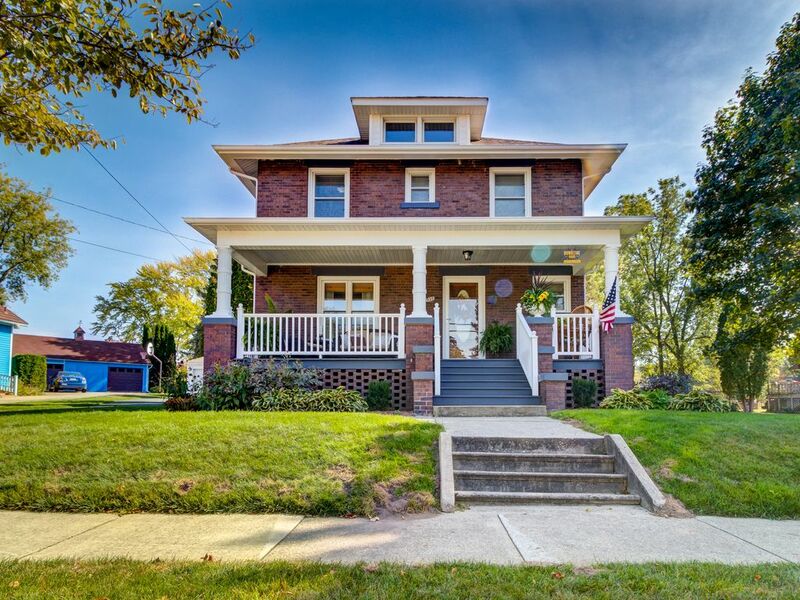 The beautiful historic charm with the original woodwork throughout. It has a large kitchen and large dining room farm table. This home is large and spacious yet cozy and comfortable. perfect place for making memories with your friends and family. Large Kitchen with island and fully stocked with every thing you will need to prepare your meals. One Large TV in the living room on the main floor and one in family room upstairs. Very large enclosed back yard with privacy fence, furnished patio with gas fire pit. Large furnished covered front porch. great for watching the horse drawn carriages go by. Also, covered side porch with table and chairs. Beautiful, private and spacious patio. Furnished with two tables and lounge seating. Great place to create a memorable outdoor get together with overhead string lights and gas fire place. The Fortress, one of Michigan’s top golf courses, located across the street. Wonderful! Every detail was carefully executed to make the home inviting and relaxing. We rented it instead of choosing a hotel for a robotics competition. There was plenty of room for everyone and the ping pong table was a hit! Every room offered it's own unique charm. It is beautifully decorated and offers every comfort. Even though it was a bit chilly when we visited, I made a point of sitting on the great patio in the back. I can really imagine bringing my family back to this house and enjoying some relaxation! Thank you for the cookies upon arrival as well! We really recommend staying at this lovely home. The pictures don't do it justice, much larger than we thought. Had a fabulously wonderful time. We felt welcome the moment we walked in the door. You can tell there has been alot of love put into this home. We hope to visit here again soon. This is the perfect place for a family reunion. Well stocked kitchen. Hosts are accommodating and accessible. We hope to be back. Gorgeous home with plenty of room! We loved the extra touches like water bottles in the rooms and chocolate chip cookies as we entered! Quiet neighborhood and so close to downtown frankenmuth! Definitely recommend this home! We spent two weeks in February at the Brownstone Haus and as always it is our home away from home (our fourth or fifth stay). The beds are comfy, the kitchen is well equipped and the design aesthetic is inviting. My daughter (3 years old) is still asking to go back to her Frankenmuth house. Thank you so much Sharon and Kurt for creating such a wonderful home. We look forward to our next stay! We rented the house to be close to family celebrating a milestone anniversary. The house was perfectly located, well equipped for all our needs and provided the perfect space for family and friends to gather. We would definitely recommend staying here, and we look forward to booking this house again in the future. Located just one block from the River Place Shops, which has over 40 shops and attractions. Across the street is Michigan’s top rated 18 hole golf course. Just a short walk to everything Frankenmuth has to offer and 15 minute drive to the Birch Run Premium Outlets.